5k times way down: what's happening? 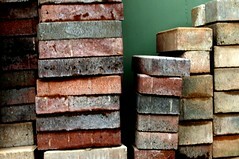 I had my first run/brick brick session of the year last night. R-B-R-B-R with the biking on my turbo trainer thingy. That followed a (deliberately) slow parkrun on Saturday where I was practicing my running form trying to get my shoulders level and my arm swing right and my foot-strike right. Anyway that slow 5k killed my calves and hurt my shoulders! Not an auspicious start to the notorioulsy painful brick sessions. With the brick on Sunday I took it slowly trying to approximate my run and ride paces/speeds to something approximating a sweetspot pace. So just shy of 160 HR (my lactate is HR 173/4/5 and my HRmax 193 to give you an idea). So you still sweat but you certainly wouldn’t class the effort as hard even though I did it for over an hour. The first transition back to the bike from the first run felt not very nice at all and it took a good 10 minutes for my legs to get properly going. I was doing high cadences of around 100 so high enough to try to flush out those nasty lactates/H+ ions. And after, with the subsequent bike/run changes, it all went quite well really thank you very much. Next Sunday’s will be harder of course. But I achieved the goal of reminding myself what duathlon is all about much to the chagrin of my legs! Still the run parts felt quite tough – especially considering as I was only averaging 4min/km over about 1 mile. Indeed that is what this post is moaning about. My 5k times have taken quite a knock over the winter as I’ve built up the mileage and introduced swimming into my regime. I had done a few speed sessions and so was hoping to approach the spring where I left off in October, but it is not to be. It is now time to really get my legs going. But not today it isn’t as it’s already a rest day! (I think I’ll go swimming). Hmmm maybe that’s why the 5k times are down.